The blue bags are VERY tactile- great work! 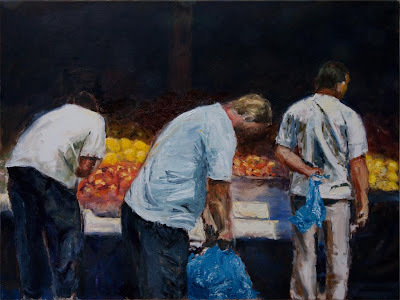 This is a terrific painting and composition of three men at a market. This could be our farmers market right here in Hamilton! Thanks Marcia. It is actually Athens. The blue bags look so reel, and make a wonderful contrast with the red fruits. 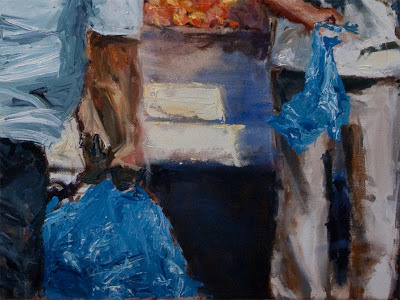 Funny how instantly recognizable something so mundane as blue plastic bags can be. Of course the whole canvas has captured an utterly tangible moment. Nice job!